Three separate clocks in one value plan package. First, a long case regulator clock can be fitted with a mechanical or quartz pendulum movement. Second, the banjo style clock in a thin profile is a quick, easy clock for decorating or as a great gift. Add a quartz movement and a glass dome over the dial. In addition, mount a colorful tile or photo in the bottom framework. 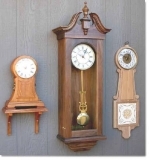 Third, the mantel clock can be placed on a shelf, dresser, mantel or build the optional shelf for placing on a wall. Movement and parts lists are included. Full size patterns and detailed text and drawing allows for easy construction of the top scroll work using common tools. A very good value. Lyre Wall Clock Woodworking Plan.